The opening concert of BHSO’s 2019 season will feature BHSO and The Joy Chorale—the orchestra’s community choir led by Khor Ai Ming and conducted by Adrian Tan. While these choral masterworks by Bernstein and Poulenc inject the musical styles of the 20th Century into ancient texts, Dvorak’s “New World” symphony drew heavy influence from African American melodies. What these composers sought to do was to bring forth traditions to a new era. Taking the centrestage of this concert is Ee Ping, a highly accomplished Singaporean soprano. Based in London, Ee Ping returns to Singapore frequently to perform with various groups including the SSO. 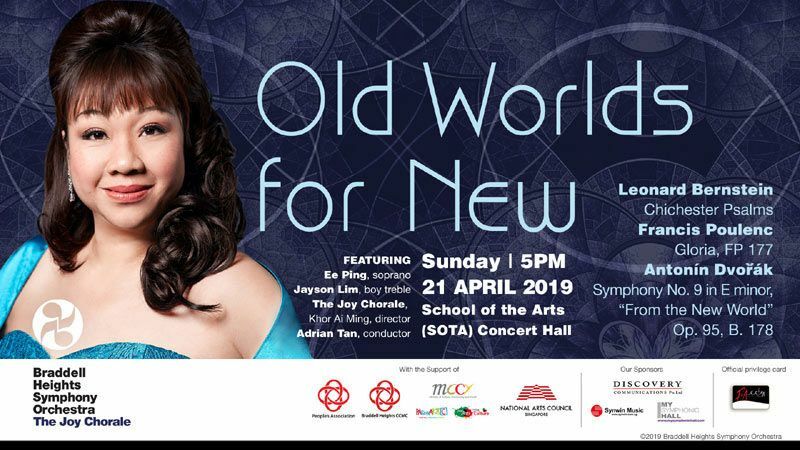 Together with BHSO and The Joy Chorale, the 2001 Singapore Young Artist Award recipient will take the audience through a repertoire that traverses time and tradition.